Three-year-old Brooklyn wears colorful, patterned leggings and never leaves home without slipping on at least one purple item of clothing (in addition to her bright purple shoes). Since being diagnosed with acute lymphoblastic leukemia in November 2015, Brooklyn’s treatments and therapies have become second nature to her: She tells nurses which arm to wrap the big rubber band around when she has blood draws. And she intimately knows every step of accessing her port to her central line for infusions. Her intense battle with cancer started when she was 2 years old. Worn out and weary, Brooklyn wanted to be carried more, often complained of leg pain in between playing and requested to “go right to bed” each evening after daycare. Not assuming the worst, her parents Grant and Michelle watched and waited for the resolution of what they thought were growing pains or a virus. For two weeks, Brooklyn continued to feel drained, and her legs ached so much one day that they shook like a newborn calf’s. Her parents knew they had to take her to the pediatrician to perform blood tests and X-rays. The whirlwind began the next morning when the doctor called to tell them to pick Brooklyn up from daycare immediately, pack an overnight bag and bring her to the hospital. As they sat waiting on the floor for children with blood disorders, they noticed pamphlets about childhood cancer on the front desk. Not long after their arrival, Brooklyn was officially diagnosed. “I just cried. I could barely talk,” said Michelle, who was pregnant with their second child. The threat of early labor due to stress added more anxiety to the life-altering news. It seemed absolutely impossible. Brooklyn began the first stage of treatment, which included many painful spinal taps, bone marrow biopsies and toxic chemotherapies. “After [the first stage], you don’t even recognize your kid,” said Grant. She gained weight on her small frame fast; lost all movement in her legs due to excruciating pain from the treatment; and had to relearn to crawl, stand and then walk with physical therapy. Cancer treatment plagued Brooklyn’s tiny body with mouth sores, mood swings, unbearable muscle pain and tingling in her nerves, which caused her to cry out during diaper changes. Signing treatment consent forms time and time again is a constant reminder to Grant and Michelle that Brooklyn’s treatment could cause long-term damage to her heart, liver and more, even causing other types of cancer. “You’re so focused on what’s going on … there’s no difference between one day and the next,” said Grant. Her parents hoped this initial, brutal phase of treatment would put Brooklyn into remission so she would remain on the standard-risk protocol, the less difficult of two paths. If she didn’t end up in remission, she would move up to high-risk and have to endure a series of therapies that would be far more trying. At points during her treatment, Brooklyn’s blood counts were dangerously low, and she needed blood and platelet transfusions to keep her going. Grant and Michelle recall that after one transfusion, Brooklyn fell asleep and started singing the ABCs in perfect tune. 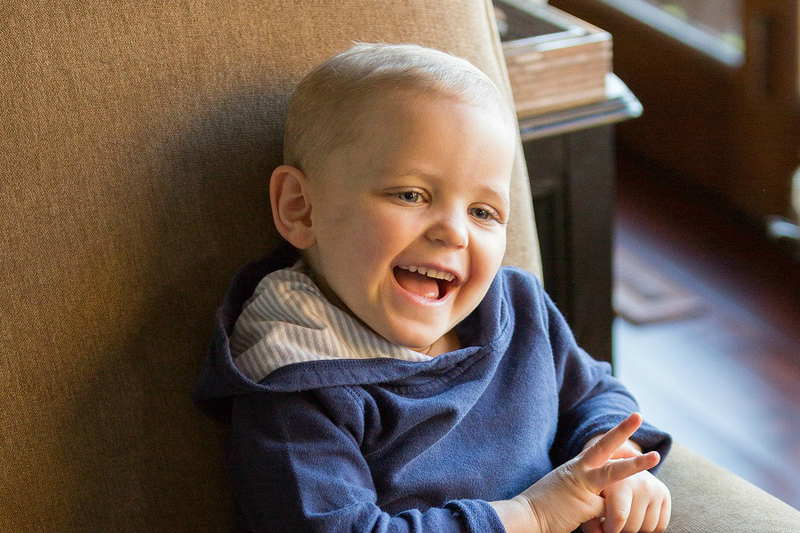 The heartbreaking contrast between childhood and cancer was never clearer than in those moments. In December 2015, the first phase of Brooklyn’s treatment wrapped up. Her family members held their breath for the news: Would their toddler take the expected, easier path of treatment? Or would she have to endure a more trying road to recovery? 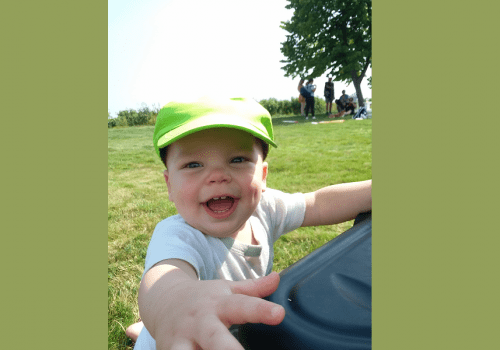 During the first traumatic and painful month of treatment, Brooklyn’s parents welcomed their second child, Thomas, into their family — adding an extra layer of stress and joy to their lives. Not only did they have sleepless nights from a child in pain battling cancer, they also had a newborn to care for. Grant and Michelle juggled frequent wake-up calls, ranging from a hungry newborn to a nearly unrecognizable toddler who also demanded food in the wee hours of the morning. High-dose steroids caused Brooklyn to feel ravenously hungry every few hours, including in the middle of the night. “It got to the point when you didn’t know if it was 5 a.m. or 5 p.m.,” said Grant. The day before Christmas Eve, just over a week after the birth of Thomas, the results came back clear: Brooklyn was in remission. Or so they were told. After they held very small Christmas and New Year’s celebrations and toasted to Brooklyn’s remission with friends and family, the oncologist told them a second review of bone marrow results showed Brooklyn was not in remission after all. “To hear that news was like hearing the diagnosis all over again,” Michelle said. Brooklyn immediately moved up to a high-risk treatment plan with a harsher protocol. Doctors replaced eight scheduled infusions of that medication with more than 40 painful and traumatic chemo shots, and Brooklyn went through intense treatment, both inpatient and at home, throughout the spring and summer. Her family still has a long road ahead, but they hold on to simple moments when Brooklyn is feeling well — like when she plays “doctor” with her stuffed animals, rides her bike or plays with her baby brother. “My dream for Brooklyn is to just grow up,” Michelle said.